The country is still recovering from the civil war that raged between 1991 and 2002, resulting in tens of thousands of deaths and the displacement of more than 2 million people (about a third of the population). Sierra Leone remains among the least developed countries in the world, ranking 184 out of 189 countries in the most recent Human Development Index. Life expectancy is 52.2 years and youth unemployment is at 70%. Rates of child and maternal mortality are high, levels of education are low and, despite rich resource endowments and abundant land, more than 60 percent of Sierra Leoneans live on less than $1.25 a day. They primarily rely on subsistence agriculture and petty trading. Sierra Leone was making slow but promising progress in the fight against poverty, disease and illiteracy when Ebola hit in early 2014. Ebola outbreak spread quickly and literally covered the entire country. CRS has been among the front line organizations who proactively responded to control the outbreak. As a result, Ebola has been eradicated within the country. Nevertheless, with a death toll in the thousands, the disease has left a permanent mark on every aspect of life in Sierra Leone. 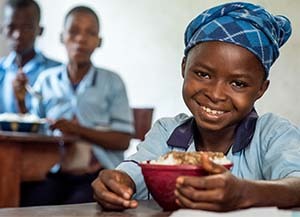 With support from the USDA's McGovern-Dole Food for Education program, CRS is helping change the future for Sierra Leone’s children. In addition to providing students with a warm, nutritious meal every school day, we are also training teachers, which is critical to improving the quality of education. Click to see how we’re making an impact. Cash payments helped participants invest where they saw short- and long-term need. Partnerships helped meet a variety of needs in villages devastated by the deadly disease. Communities in Sierra Leone are learning lessons in nutrition, microfinance and sanitation. Recent flooding and landslide leaves hundreds missing. Catholic Relief Services started work in Sierra Leone in 1963. During the 1970s and 1980s, CRS focused efforts on supporting education projects and health centers for mothers and children. Between 1991 and 2002, civil war killed more than 20,000 people and displaced and destroyed the livelihoods of millions more. In response to the war, CRS Sierra Leone, like most international agencies operating in the country, shifted strategy from development aid to emergency relief. By 1995, CRS was supporting displaced populations throughout the country with food, medicine, clothing, shelter and household items. After the war ended in 2002, the focus of government and nongovernmental agencies turned to safeguarding peace and transitioning to development. In March 2004, CRS and other international agencies launched a three-year development program. Staff members worked side-by-side with communities devastated by war to execute plans designed to restore livelihoods and improve the food security and health status of rural households. The programs implemented by Catholic Relief Services and our partners in Sierra Leone are helping to rebuild the country from the inside out. In a country as fragile as Sierra Leone, peacebuilding is crucial. Integrating peacebuilding in our projects is a major focus for CRS. In spite of the natural resources in Sierra Leone, more than 60% of the population in the country lives below the national poverty line. About 62% of the population lives in rural areas and depends on agriculture for food and income. Nearly 75% of the total land area is arable. However, the majority of the rural poor are smallholders with land holding averaging from 0.5-2.0 hectares. Size of land, farm inputs and technical know-how are some of the primary limitations for smallholder farmers and that's why CRS is working with farmers to broaden their farming knowledge and business management skills. As infrastructure was rebuilt after the war, community health programs ensured the well-being of the people of Sierra Leone. CRS has invested in nutrition and health education for students. While Sierra Leone's medical facilities are improving, the situation is still dire. For many Sierra Leoneans, health services are too expensive, forcing families to turn to traditional medicine and poorly trained health workers. CRS helps poor and vulnerable people access health care services, and encourages them to take greater responsibility for these services. In one CRS health program, the staff organizes immunizations for children under 5 years old and counsels mothers about feeding and caring for newborns. CRS also is heavily involved in raising awareness about malaria and Ebola prevention in Sierra Leone. Malaria is the number one cause of child mortality in Sierra Leone. This preventable and treatable disease causes nearly 40% of the deaths of children under 5. The national strategy seeks to provide access to malaria control for all, including increasing the percentage of cases treated promptly and effectively from 50 to 80% and ensuring that at least 80% of the population has access to, and knowledge to use, at least one preventative method.